The Government of Belize, through a press release issued yesterday, Sunday, has confirmed that there was a confrontation in the Sarstoon River between the Guatemalan Armed Forces (GAF) and the Belize Defence Force on Saturday in the area where Belize is presently constructing a Forward Operating Base (FOB) to combat illicit border activities. As a result of Saturday’s standoff between the two countries’ military forces, tension in the Sarstoon River is now at an all-time high, because recently, Guatemala has been insisting that the entire Sarstoon River belongs to them, notwithstanding the 1859 Treaty between Britain and Guatemala, which recognized Belize’s sovereignty of the Sarstoon River up to the mid-channel, which includes Sarstoon Island. Guatemala has now been using her military might to enforce her insistence that the Sarstoon River and Sarstoon Island belong to them. A government release yesterday said, “The Government of Belize confirms that a confrontation between Belize Security Forces and Guatemalan Armed Forces occurred late Saturday evening at the Sarstoon in the area of Belize’s Forward Operating Base. The GAF approached the FOB, though they never actually attempted to come on to our land, and behaved in an extremely hostile and threatening manner, insisting that our troops should not be at the Sarstoon. This afternoon, Prime Minister of Belize, Rt. Hon. Dean Barrow, convened a meeting of the Belize National Security Council to discuss ways of de-escalating the tension and to work toward a diplomatic resolution of the Sarstoon River issue that has exposed his government’s weak responses in asserting Belize’s sovereignty over our side of the Sarstoon River in view of Guatemala’s new hardline assertion that the entire river belongs to them. PM Barrow began his briefing to the Belizean media by making reference to government’s Sunday press release: “The facts are as was stated in that press release,” he said. “We told you in that press release that the Ministry of Foreign Affairs would be issuing a strongly worded note of protest and dispatching that, and that has been done. The Guatemalans have responded to that note of protest and dispute our version of the facts,” Barrow said. The PM then noted what he termed “a couple of significant things” about Guatemala’s response to Belize’s diplomatic protest note. “They denied that they behaved in an extremely hostile and threatening manner. They said they confronted a Belizean vessel, which, the way it is framed is not factual, and they complained about the failure on our side to follow the security protocol usually followed in the Sarstoon River, and in brackets they described that as the status quo. They say at no time was there any provocation by the Guatemalan authorities towards the crew of the Belizean vessel,” Barrow detailed. Barrow said that the Guatemalans are very clear about what they wanted to say and they insist that they are sovereign over the entirety of the Sarstoon. Barrow added that there has been no traditional request to Guatemala on the part of the Belizean security forces to go up the Sarstoon River. Barrow went on to mention that in some quarters, it is being claimed that what this incident has done is expose the fact that the government was not being entirely truthful with the Belizean people, that before now, when Belize’s military went up the river, they asked permission first. Barrow said that has never been the case and not even the Guatemalans are suggesting that was ever the case. “We are at a juncture where the National Security Council has concluded its meeting, given the potential for a repeat of what happened on Saturday, given the potential for escalation of tensions, given the potential for the possibility of an outbreak of hostilities resulting in an exchange of gunfire and the possibility of casualties. It’s important to make the point that the incident that did occur was diffused. We now know for sure in consequence of our General Jones having gotten in touch with his opposite number in Guatemala, who, I now learn, is the highest ranking military person in Guatemala, the head of the armed forces,” said Barrow. Barrow credited BDF General David Jones with diffusing the standoff on Saturday after he (Jones) spoke to Guatemalan General Perez, whom he met in San Antonio, Texas, on Thursday at a regional security conference. Barrow also said that General Jones and General Perez have come to an understanding that there is a need for some kind of modus vivendi to be worked out between the two militaries in respect to the Sarstoon. “Our note of protest makes clear that we maintain our position with respect to our sovereignty over our portion of the Sarstoon as demarcated by the 1859 Treaty. Their response also makes clear that they maintain their position, which is to claim sovereignty over the entirety of the Sarstoon. In the same way as there are protocols to deal with other sensitive border areas, and the modalities for handling potential flashpoints, it is our view that there must be similar protocols to govern the Sarstoon; otherwise, inevitably there is going to be a problem. They are not going to relinquish their position and we sure as hell are not going to relinquish ours,” said Barrow. Barrow went on to state, “We have said to Belizeans that it is a matter for the government and for the military to maintain our assertion of sovereignty and the stepping up, the ratcheting up of their position is directly related to all that have taken place with respect to the Sarstoon and the visits and expeditions, well-meaning on the part of civilians, designed to assist the military, which needs no assistance. We recognized that while our people took a stand on Saturday, and have to continue taking a stand, there must be a resort to diplomacy in order to settle this issue. “We can’t settle it in consequence of any outbreak of war. That is unthinkable and we don’t want to go there. Of course, this meeting was also about tasking both our military and our diplomats to reduce to writing the way forward for Belize in the event of whatever contingencies. Barrow then noted, “You know that tomorrow morning there is a meeting in Washington. The last formal position that we knew of with respect to the Guatemalan delegation was that they are not going there to talk about the Sarstoon. They are going there to talk about funding for the adjacency zone and other matters. It is our position that we must talk about the Sarstoon. Things having gone as far as they have on Saturday will oblige a realization on the part of the Guatemalan delegation that indeed the Sarstoon must be discussed. “If that happens, any protocol can be agreed during the Washington meeting. All we want is a commitment for there to be a specific discussion going forward about the Sarstoon and only the Sarstoon so that we can come to some sort of resolution. “The Ministry of Foreign Affairs is going to lay out a plan for diplomatic campaign, demarches, so that again the international community can know at all times precisely what the position is and can be aware of Belize’s case,” he said. Chief Executive Officer in the Ministry of Foreign Affairs Lawrence Sylvester said that Belize is keeping the international community, and particularly the regional grouping to which we belong, appraised of the situation. General Jones was asked to go over what happened on the Sarstoon on Saturday. He said that a Guatemalan vessel went over to the Forward Operating Base and spoke to the troops over a loud hailer and informed them that a vessel had gone up the Sarstoon and gone all the way to Cadenas and did not report to them. They were expressing their dissatisfaction that they did not know. “Our troops have never gone in there and asked permission. The vessel that was there speaking to our troops did not want to leave the area and they were giving the impression that they were going to remain there. The troops took it as some kind of intimidation, and they started making phone calls, that eventually reached my ears,” said Jones. General Jones said the calls eventually reached the Minister of National Security and the Prime Minister and he (Jones) subsequently spoke to his Guatemalan counterpart and expressed concern about the situation at the Sarstoon. General Jones further said that he and his Guatemalan counterpart agreed that there should be peace in the Sarstoon. “He is committed to that and I am committed to that. So we are going to work through a road map to make sure that happens,” Jones stated. “There isn’t going to be anymore interceptions and we are going to work toward peace in the area,” General Jones said his Guatemalan counterpart told him. “Immediately after I called him, about five or ten minutes after, the vessel that was in front of the FOB had disappeared. It was a sign of good faith. So I am going to bet on the relationship that we just established,” General Jones said. The BDF General said that the Guatemalans’ boat had about eight soldiers on board. There have been a number of incidents on the Sarstoon River involving elements of the Guatemalan Armed Forces and the Belize Territorial Volunteers (BTV). The most recent incident occurred last month when Guatemalan Navy boats blocked members of the BTV from traversing the river on their way to Gracias Adios to clear the border marker there. 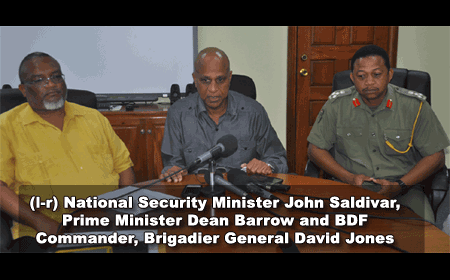 Furthermore, Prime Minister Barrow, along with members of his National Security Council, has repeatedly warned the BTV not to carry out any more expeditions to Sarstoon Island, because their presence is antagonizing to the Guatemalans and is putting the lives of BDF soldiers at risk. Saturday’s incident, however, did not involve the BTV nor Belizean civilians; rather, it involved the BDF at their Forward Operating Base, the same general area where the Guatemalan Navy boats blockaded the BTV boats last month.